The e-Health lessons from healthcare.gov debacle is being debated widely. The idea of applying large scale IT initiatives in clinical domains has its own risks. As we relentlessly move towards a fully digital healthcare ecosystem, is it possible to hide some of its complexities from the clinicians? Patient empowerment is the buzzword in eHealth now and clinicians are generally viewed with some skepticism. EHealth has learnt over the years (in the hard way) that the clinicians may be reluctant to relinquish their firm grip on clinical data. After all they generated the data and they are the custodians though they do not own it! One of the approaches worth trying is to give the clinicians control and freedom over their end of things. In other words, separate enterprise EMR from the physician EMR. However the key to success in this scenario is interoperability. 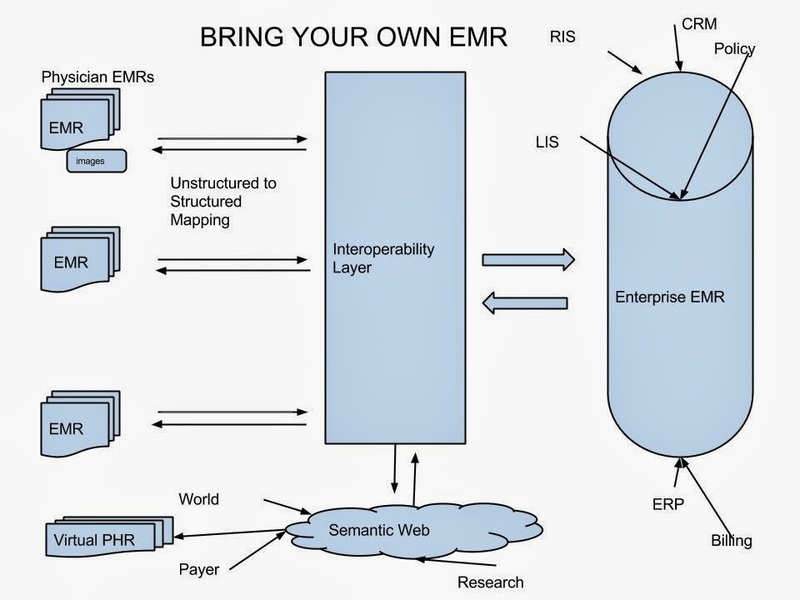 Interoperability of EMRs are being actively explored by many research teams and organizations. However the emphasis is on better standardization. As interoperability emerges as a global paradigm, the standardization strategy that has failed for the last decade or so, still seems impractical? I am working on an interoperability solution that segregates physician EMR solutions logically and physically from Enterprise EMR solutions. I would like to call this Bring Your Own EMR (#BYOE) pronounced as ‘bio’. The general framework is shown above. If you would like to join the #BYOE initiative or give feedback, shoot me an email!! Bring Your Own EMR by Bellraj Eapen is licensed under a Creative Commons Attribution 4.0 International License. Based on a work at http://nuchange.ca/?p=21.